Conservation, rather than restoration or repair, works with the layers of history accumulated by a historic textile over its entire lifetime. Nothing can ever be the same twice, and every textile’s history is unique, interesting and revealing. Whilst good conservation aims to reveal a textile’s original appearance where possible, we do not aim to replicate but to preserve and to present a textile in the best possible condition as well as prevent further deterioration and provide the best conditions for the textile’s continuing story into the future. Just as the patina on an antique piece of furniture adds to its beauty, interest and value, so the history of an antique textile can be the most unique and revealing thing about it – even when that history might include being cut up to fit into smaller rooms; being folded and stored in a drawer; or damage and decay through use and re-use. A conservator’s art is in knowing exactly how to treat and clean an individual textile, and how to ‘read’ its history and recognise its original construction and any subsequent alterations. Every textile tells a story, and individual threads have meaning. At once a scientific and intensely practical art, historic textile conservation also throws up philosophical and ethical questions which are a delight to encounter and grapple with. A textile’s history is a good analytical tool and often sheds light on society and individual lives through history which might not be guessed at otherwise. Engaging and working with beautiful objects, analysing how they were made, how people lived and uncovering the unique spirit of a historic textile is at the heart of textile conservation. 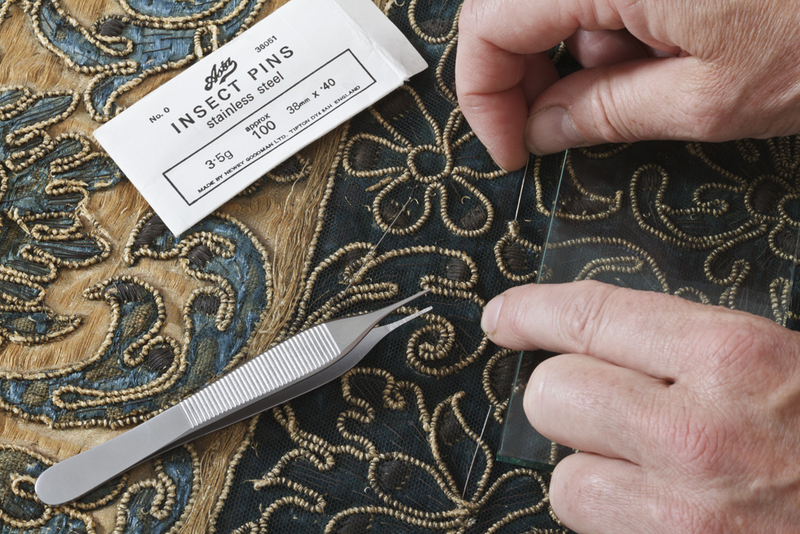 We provide a comprehensive service that takes into account the technical as well as the aesthetic aspects of your historic textiles, and which respects and augments their unique histories.